The Drothmeri Steward is a Dunmer marauder and a member of the Drothmeri Army responsible for keeping track of the rest of the army and their pay. Frathen Drothan outlines these duties in a note, and the Steward's Registry shows that the steward keeps track of all the comings and goings of his charges. He is armored with the best possible heavy equipment for the player's level (except a helmet), although he is unlikely to have every item. He may have boots, gauntlets, greaves, a shield, and/or lower class pants and shoes. 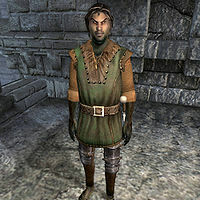 Like most members of the Drothmeri Army, he also possesses a Drothmeri Tunic. For a weapon, the steward uses a dagger or a shortsword, which may be enchanted. The Drothmeri Steward is infected with Tunnel Cough. This page was last modified on 25 December 2013, at 19:28.